AIChE’s 35 Under 35 Award recognizes 35 outstanding young professional AIChE members, all under the age of 35. Each awardee was selected for their successes and contributions in the area of bioengineering, chemicals, education, energy, innovation, leadership, or safety. Other topics in this issue include: adsorption basics, part 2, inline particle analysis, equipment condition monitoring, and sustainability drivers. This month’s Career Corner (p. 22) offers suggestions for coping with stress at work. For many of us, a major source of stress is the feeling that we have too much to do and not enough time to do it. There’s a counterintuitive solution to this problem: Give some of your time away — i.e., volunteer. 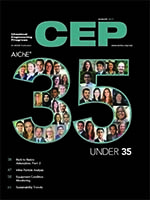 AIChE and the Young Professionals Committee (YPC), with support from the AIChE Foundation, are recognizing these 35 outstanding young professional AIChE members with the AIChE 35 Under 35 Award because they have made significant contributions to the Institute and to the chemical engineering profession. This article focuses on adsorbents, including activated carbon, zeolite molecular sieves, and polymeric adsorbents, as well as ion exchange resins. In-process measurement provides continuous information about particle behavior under changing process conditions, enabling engineers to optimize difficult processes. This article guides you through a condition monitoring program framework and details techniques to assess the function of your equipment. Motivated by legal and regulatory requirements, as well as by financial incentives for taking voluntary actions, many companies are embracing more proactive risk-management methods and building sustainability practices into their business models.